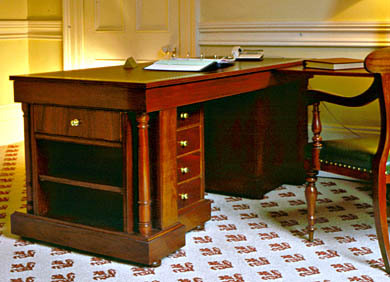 Georgian style reception desk in solid Mahogany and flamed Mahogany veneers, with tooled quality leather working surfaces. A beautiful practical desk designed to sit comfortably with genuine antiques in the house. Commissioned by private client for restored Georgian house in Dublin. French polished by hand to a finish.